I'll update you first on my Olympic saga. You all voted for the Knot Cable Jacket. I put the yarn, needles and pattern in my bag to take to Madrona...without looking at it. At 2 on Friday I cast on. I was in my Spinning and Knitting Estonian Lace class next to--get this--Stephanie. I felt this was an auspicious way to start. And just in case you don't believe me, here's Stephanie's cast on. Notice how she's beating me already. I hit my first snag about three minutes in. 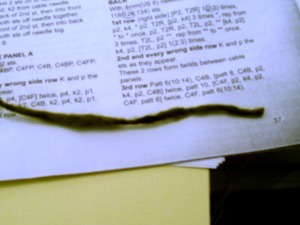 I came across this thick, bloated, odd bit in my yarn. I had to cut it and start over. 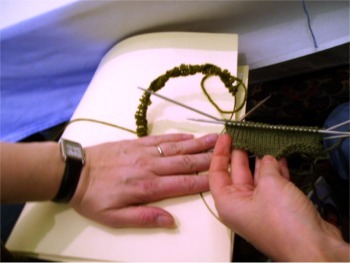 About 20 minutes later I'm still casting on and Stephanie has something that already looks like a sleeve. It just went downhill from there. My pattern is not charted. My pattern is not written in a comprehensible or easily knit way. That is why by Saturday night everyone in camp and the greater Tacoma area had heard me cursing forcefully and repeatedly and I had decided Debbie Bliss was the devil. It all came together when I looked at my knitting and saw this. I spent a long time going way into the wee hours on Saturday dropping down 11 rows on one entire cable panel and reknitting it only to find errors in all the cable panels. I went to sleep. 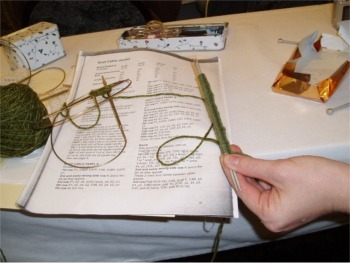 In the morning I saw that I had also reversed the direction of some of my twisted stitch columns. At breakfast while cursing and talking to myself I realized that I had to rip back to the top of the welt. I did. Then proceeded to knit several rows with mistakes in them again. 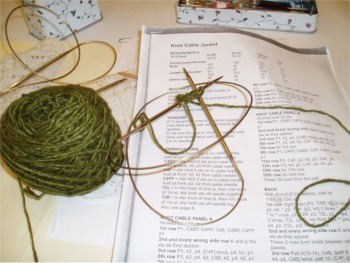 When I got home last night I wrote out a chart for the pattern and completed the first set of knot cable panels without any errors (that I see so far). I think I'll be done with this sweater by the end of the next summer Olympics. With luck.